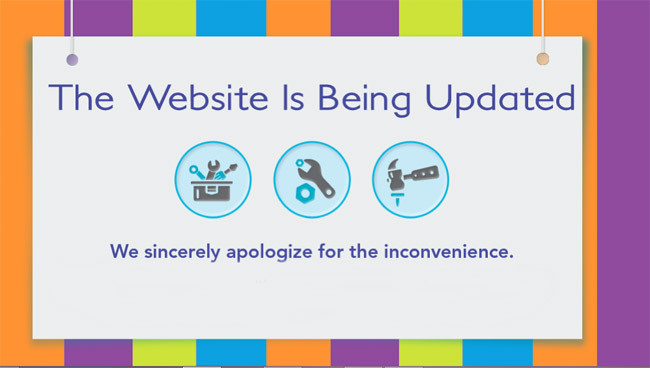 Earlier today, we mentioned how tengai.co.zw, the new Zimbabwean classifieds platform was down. According to information we received from Tengai at the time, this was part of an exercise to update the platform’s features. This was also displayed on the Tengai page earlier today. Net neutrality wins – hacked by Anonymous Zimbabwe. There’s no indication that this Anonymous Zimbabwe is affiliated to the Anonymous Africa outfit that hacked websites both abroad and in Zimbabwe some years ago through DoS attacks. 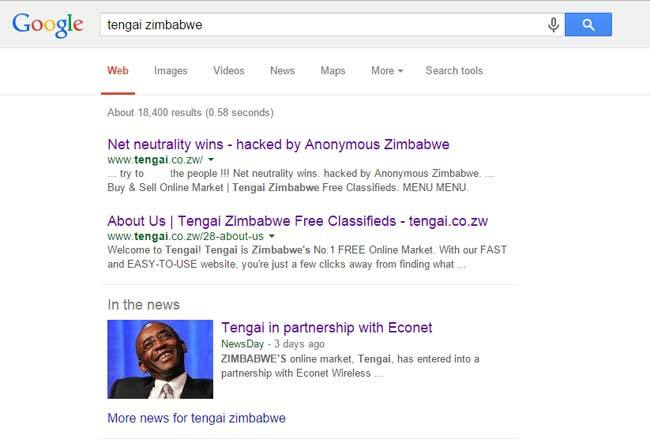 This “net neutrality hack” follows the backlash that was triggered by information that Tengai though operating as a separate startup, has a relationship with the mobile operator, Econet Zimbabwe. Econet’s founder, Strive Masiyiwa has a stake in the startup. Through an arrangement with Tengai, Econet Zimbabwe is providing Econet broadband subscribers zero-rated access to the classifieds site. This has caused a heated debate around the net neutrality issue over the past few days. Tengai has been given a lot to deal with especially for a new e-commerce platform and people have already started to voice their concerns. The updates that the team has been working on might not be focused on net neutrality, but hopefully they will touch on security. To me it looks like a pretty pathetic attempt to derail the platform from succeeding because a competitor fears competition. At the end of the day, Zimbabwe needs companies like tengai to promote e-commerce to the masses. While zero-rating might not be a perfect solution, I think the benefits outweigh the downside. Perhaps a solution would be for Econet to offer zero-rating as an option to other developers – that way it could legitimately claim to be committed to promoting e-commerce and driving a truly digital future for zimbabwe. I wouldn’t mind so much if Econet partnered to offer zero-rating to other local startups . We’re all working towards the same goal of creating an e-commerce ecosystem in Zim. Right now the number 1 mission should be to promote the benefits of online retail to the masses – fearing competition at this stage is premature. I hope to see tengai.co.zw online again soon – seemed like a cool site. Would be nice if other sites can also partner with Econet to help grow the sector. We have a mountain to climb and together we should eventually succeed. Wow. Crazy things that people do to prevent competition. I wonder who’s behind it? To be honest, while I’m not necessarily in favour of selectively zero rating sites, I think it’s a shame people resort to cyber crime to get across their message. It damages the perception of online businesses and will possibly prevent entrepreneurs from wanting to start an ecommerce website in fear that competitors may attack them too. startupguy, I doubt the hack was intended to “Stop” competition. Any real business welcomes competition as it keeps you on your toes and doesn’t let you get comfortable. As for “It damages the perception of online businesses and will possibly prevent entrepreneurs from wanting to start an ecommerce website in fear that competitors may attack them too.” – this is the real world of online business, it’s part of the territory throughout the world, not just Zimbabwe. Something James Gibson should have considerable knowledge about. If the reason you won’t start and e-commerce business is fear of being hacked, do something else or leave it to people who don’t fear. Curious why you, Raymond, are pro-this hack? Point is there is not any e-commerce to talk about, possibly due to lack of trust and other issues like a poor Postals/delivery system (case of online shopping). How then does this hack cultivate trust for whatever website you root for when all pple will think of is Econet was hacked therefore i shall not enter my debit/credit card info on any site whatsoever. Sounds like an ‘either i rise or no one rises’ attitude you have there brother! I am merely pointing out that part of the risk involved in setting up an online business is being hacked. I do not promote hacking, neither do I promote the way tengai.co.zw was given preferable treatment in how it was launched considering there are a multitude of already established classified sites in Zimbabwe. If Econet wanted to innovate then they should have considered a partnership with already established online businesses in Zimbabwe to prove to startups they’re willing to work together rather than muscle them out. If you are concerned with entering your credit card details because of this hack, you should be it’s a real issue, more so in a developing online market like Zimbabwe where consumers are still learning how ecommerce works. lol. no teleco, or any business for that matter, will offer free lunches for all. surely there will need to be some mutually beneficial agreement? perhaps advertising agreements or online retailors could offer free discount vouchers to telco customers . i can see possibilities for lots of partnerships between startups and operators. maybe this could be the start of both parties workin together for a common cause. just a thought. Hacking is legal, plain and simple. I sincerely hope people condemn this criminal action. Whether you agree with zero rating or not, this is not how to conduct a protest. We should try to work with the operators not fight them. i’m with you. cyber criminality damages everyone a should be condemned. i hope the attacker is caught and tried. i completely condone it. while some may disagree with zero-rating websites, this is not a legitimate way of protest. i think it stinks! telco operators across the global from europe to america, africa to aisa, zero-rate certain services (music streaming; social networking sites; e-commerce sites) – never have I hear of such destructive methods used against them. healthy to debate but completely wrong maliciously attack. we need to do all in our power to ensure a healthy e-commerce ecosystem – partnerships and collaboration can help drive it forward. cyber criminality = criminality. If I broke into my neighbours house I’d be arrested. If someone maliciously hacks a website, they should be prosecuted. Sure it happens to every website at some point (Google, eBay , paypal), but this is not an excuse. I hope tengai catch the guy and go back online soon. Now let’s look at Tengai. It’s a product that people in Zimbabwe are keen on using to improve their business. It has access to it’s content completely enabled – it’s free of charge – you see, there’s our beloved net neutrality. Those that know, know that Econet does not degrade the delivery of the competing content. Econet abides by the principle of net neutrality. In fact, the fact that Tengai is zero-rated is an effort by Econet to bring e-commerce to the vast majority – just like Facebook with Internet.org. People want to use the Internet to improve their businesses and livelihoods and it’s clear Tengai is here to help regular Joe get free access to a site that Zimbabwe will rely on to facilitate trade and strengthen the economy. I don’t think it’s flawed. Net neautrality is really about ensuring the internet service provider doesn’t block or throttle any services or create fast lanes. If tengai partners with econet to provide free access to its website, this doesn’t block access to any other services. That’s why the US ruled in favour of allowing zero rated content. If they are neutral, then competing sites MUST be allowed to request ZERO-RATING so that the playing field is level and competition is fair. i saw it on day one. they used an offshelf solution http://ocportal.com. smne of the size of econet could afford developing a solution themselves. Anyone can launch a classifieds it’s the business behind the business that will make it work/fail which is how classifieds.co.zw is where it is today. No need to re-invent the wheel. Yet we blame govt for chasing away investors. What the hell is wrong with you people? In marketing there a guerilla strategy, a tactic by a small and new entrant into a market to gain foot hold in a market. Busy attacking Econet which trying to innovate whilst Telecel ended with Telecash end Telecare, not to mention Netone. Why are we fighting those with the financial muscle to develop ecommerce in Zim? You are thick as a wall if you think this is marketing. I dont condone hacking but I am glad the point is being made. Having financial muscle doesnt mean we should tolerate anti-competitive behavior that will kill our ecosystem and destroy start-ups before they even start. Here is another side to this coin. What is Econet getting out of the deal here, they offering free data and sms but for what upside? How it is allowed that Strive can order a public company with public shareholders (us men on the street) to provide a free service to the benefit of his privately owned company! He is literally taking money out of the public company for the benefit of himself at the expense of the shareholders who have bought the shares with the hope of it being a solid investment. Tengai is integrated with ecocash – so they’re probably betting on that as a revenue earner. Probably also advertising opportunities as well. In the larger scheme of things, if tengai is successful it should open up the ecommerce sector = more data revenues and ecocash transactions across the whole ecosystem. Seems like a pretty strategic partnership. Both parties should benefit eventually. Shame hey. Tengai looked like an awesome site compared what’s currently available. Hope they are up and running again soon. I think this could be the game changer we need for exommerce in zim to take off. Why don’t econet also seek partnerships with other sites to kick start online businesses. I think it could be a winning strategy for both startups and operators. some peope here have retard minds, u cant stop yo nxt door frm giving their releatives free beef as long as they can afford it. musarwadziwa nekudya magreen vegetables vamwe vachipihwa free beef vakomana. If u cnt beat them join them and if u cnt join them make them yo rivals not enemies. Lack of devine wisdom is to blame. If u want to tok about net nutralitythink about opera mini bundles tht dnt offer access to facebook. These crackers must stop being stupid, Mr Soul dont tell me tht u r supportin this thugs.